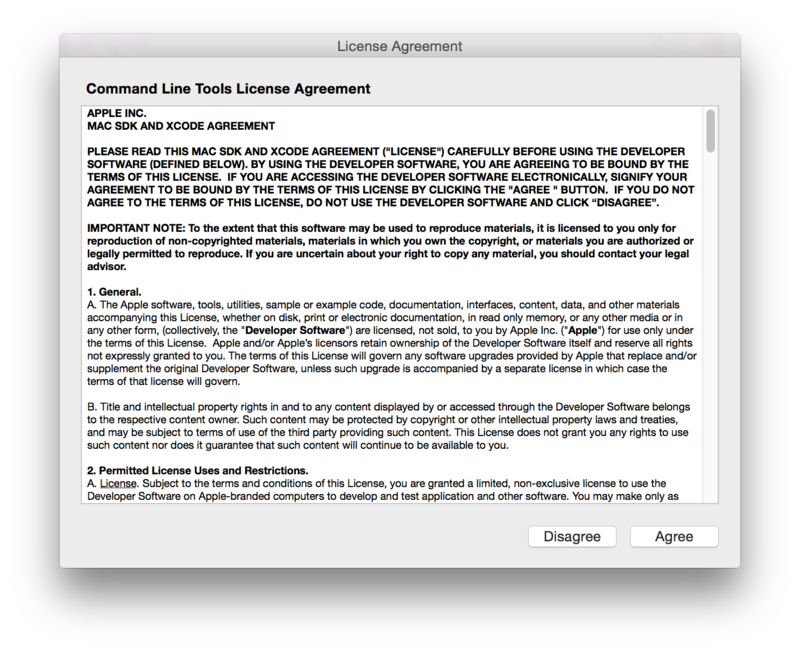 Click Install in the dialog box that pops up and the package will be installed. 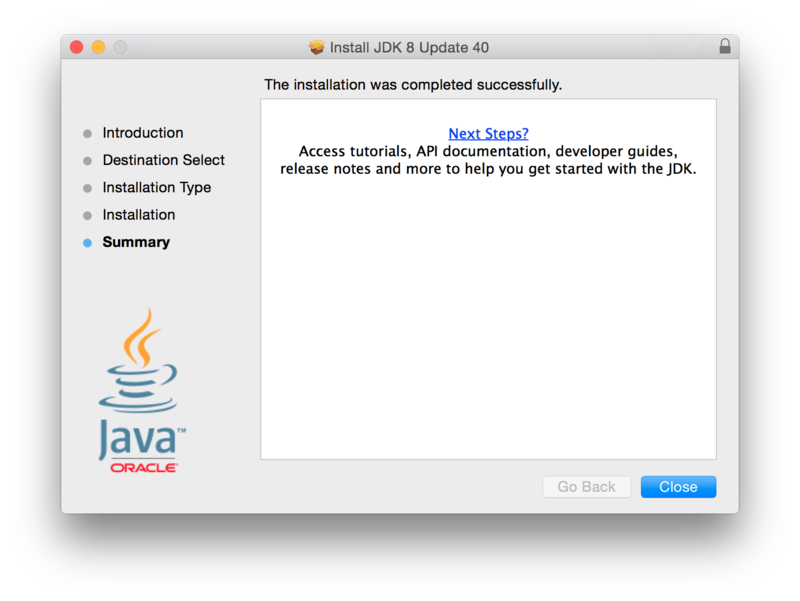 Ensure that the latest versions of the Java 8 JRE and JDK are installed. Once Homebrew installs, run ‘brew doctor’ to finalize the installation of homebrew. Once homebrew is installed and set up, the PATH needs to be updated to ensure that all homebrew binaries are executed correctly. Once this is done, load the new $PATH by sourcing it. 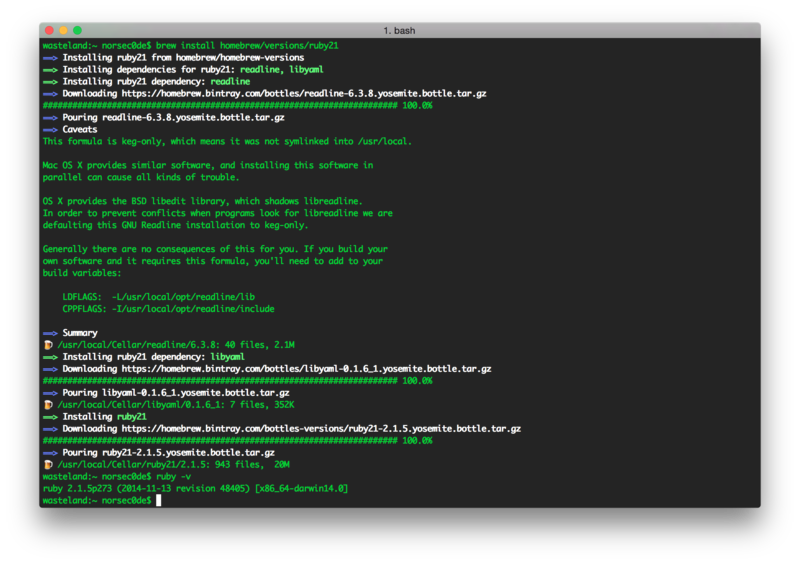 Before Metasploit can be installed, some more dependencies should be installed via homebrew. This can be installed either via the dmg from their site, or via homebrew. Homebrew tends to keep their packages updated and it is quite easy to install and manage. Now time for the part the most frequently causes issues. Ruby 2.1.5 is recommended as seen in this file. Since Homebrew doesn’t have 2.1.5 as an option, we’re going to take whatever 2.1.x it can give us. At the time of writing this, the version pulled was 2.1.5 which works perfectly for us. 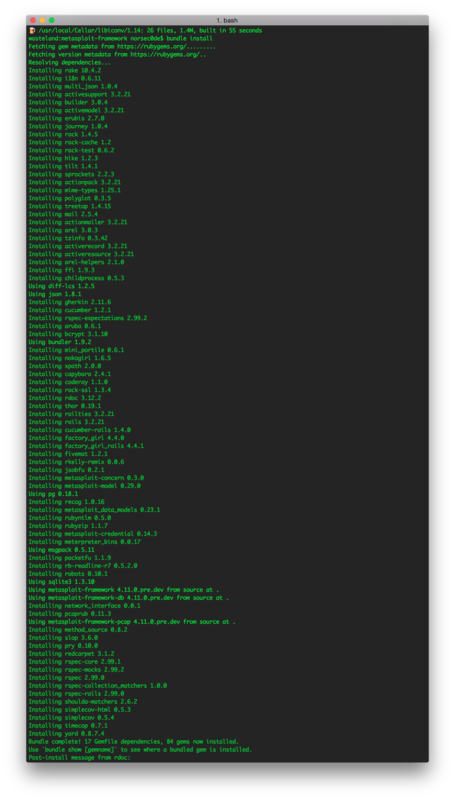 Now, the most important part of the ruby installation, Ensuring that the ruby version you are running is in fact 2.1.5. Now, time to install the backend database that Metasploit uses. If the Homebrew install did NOT complete this for you, the next step is to initialize the database for first time usage. As of 9.3.5_1 it looks like the homebrew installer wraps up by running this command for you. Create a new user msf* and a database msf with the user msf as the owner. As Metasploit uses vncviewer for its VNC payloads, and OS X comes with a VNC client, we need to create the needed vncviewer file that will call the OS X vnc viewer. Using brew and bundler the properly supported gems need to be installed. Now that the framework has been installed, and proper bundles installed. The database connection needs to be configured. Save the following into /usr/local/share/metasploit-framework/config/database.yml replace <password> with the msf user’s password you set earlier. Now that this file has been created, source bash_profile to load the variables for the database. Now, to start Metasploit Framework as YOUR USER to it initializes the schema for the database for the first time as a NON ROOT user. Run this from within the /usr/local/share/metasploit-framework directory. Due to the way variables are handled when using sudo, you will need to give the –E option. Tagged armitage, metasploit, osx, yosemite. Bookmark the permalink. Ahora que el marco se ha instalado, y paquetes adecuados instalado. La conexión de base de datos necesita ser configurado. Guarde lo siguiente en /usr/local/share/metasploit-framework/config/database.yml reemplace por la contraseña del usuario msf establecidos anteriormente. [-] Lost a connection (java.io.StreamCorruptedException: invalid stream header: 3C68746D): disconnecting all! Try updating your Java to 1.7. Great guide, thanks very much. Try navigate into the “metasploit-framework” folder and then run “bundle install” from within that folder. It looks like you might be in the “metasploit-framework/tools” folder. Try rerunning it from the parent folder. It looks like it could be one of a few issues, try some of these to halp troubleshoot. Firstly, try running ./msfconsole instead of msfconsole and see if that makes a difference. 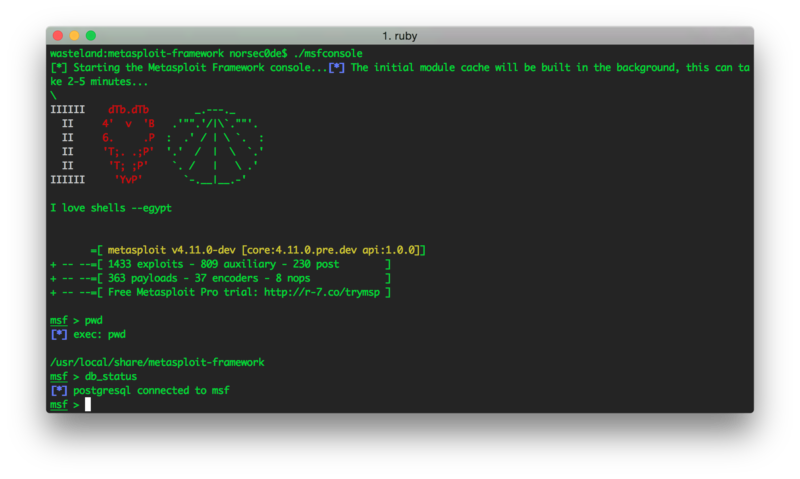 Another thing I’ve noticed is that MSF now requires Ruby 2.1.x Try installing that version and see if it works. I’ll update the post to reflect this. 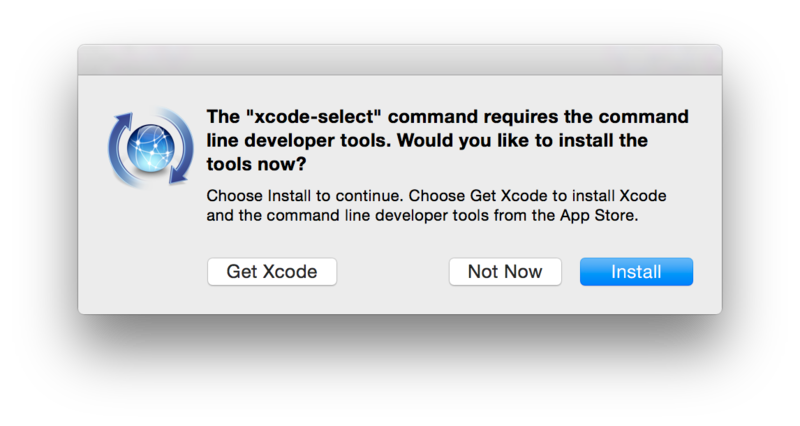 Last option could be conflicting or borked Ruby installs. Rub “which ruby” to see if the homebrew version is being run by default. also, check that RVM is not interfering. If possible, remove all version of Ruby, cleanup the $PATH and then jump back to the Ruby installation in the tutorial. Thanks dude, your concern is very much appreciated. To be honest, while installing metasploit, I had actually gove for the 2.1.5 ruby version, and when I started encountering these problems I did think it was a s a result of my ruby version, and as such I uninstalled 2.1 and reverted to 1.9.3. I’ve just re-installed about to go through this same procedure. I’ll do all the troubleshooting in the morning and see what turns up. Aight, re-rolled last night and updated the blog post as of this morning. The prob you’re having might have been with that custom Gem installation options. Try again with this guide. Worked well for me. Let me know how you get on. Thanks man, I would equally try do a re-run and get back with result results. I had gone through with the entire process again, even had to uninstall my previously installed Homebrew and Ruby just so I could do a clean install, but somehow I managed to lad in the same ditch as before. Is there some way I could do totally reversal of the entire process or possibly get some remote help? I’m sorry if i’m asking too much, its probably cos I’m not as grounded as you guys. Right now, I’m stuck and lost for options. working fine: please don’t worry and just ignore them. Thanks! You haven’t updated for at least 24 hours. This is a long time in brewland! remote: Counting objects: 240221, done. Receiving objects: 100% (240221/240221), 33.40 MiB | 39.00 KiB/s, done. Resolving deltas: 100% (178834/178834), done. Checking out files: 100% (3515/3515), done. HEAD is now at 8400357 texmath: add 0.8.0.2 bottle. FYI, I have installed the latest version of Quartz, and Ruby. I equally ran the suggested `brew prune` command. Honestly, there’s just too many things, that I don’t understand and pasting them here would be several pages, but if you require any info, I could provide you. metasploit-framework at /usr/local/share/metasploit-framework did not have a valid gemspec. That basically sums up the problems I’m facing, I hope I can somehow get help to get it resolved. Yea, you have a ton of errors in there but nothing that looks too hard to fix. The errors actually tell you how to fix the problems and you should definitely sort them out before re-installing. You can quickly see which one is being run by running the command “which ruby” and the output will show you which one is being executed. If it’s the “/usr/local/bin/ruby” then you’re running the wrong one. If the output is not “ruby 2.1.5p273 (2014-11-13 revision 48405) [x86_64-darwin14.0]” then the rest of the installation will fail. Hope this gets on the right track dude. Please walk me through how I should proceed. I’m a beginner in all senses of the word at this. Ah yea, that damn swap file. To remove it, run “rm /usr/local/share/metasploit-framework/config/.database.yml.swp” and that should kill it. If you’re unfamiliar with how vim works, try using something like “nano /usr/local/share/metasploit-framework/config/database.yml” Paste the info into the file, Ctrl + O to Save and Ctrl + X to exit. libxml2 is missing. Please locate mkmf.log to investigate how it is failing. Make sure that `gem install nokogiri -v ‘1.6.6.2’` succeeds before bundling. Armitage won’t start. MSF works fine. Great guide! Worked flawlessly for me and using Ruby ruby 2.1.6p336… Thanks! Hey, thanks Soo Much! I did step-by-step and everythings ok! Iam running on Mac OSX El capitan. I just need to change version on the cp command on postgresql. You rock!! thank you! I installed armitage by your commands on ruby. But, How can i uninstall armitage?